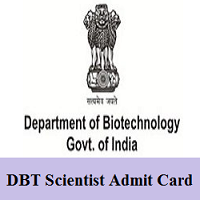 DBT Scientist Admit Card 2019: Candidates who have applied for the Department Of Biotechnology (DBT) should check the current article. Moreover, the officials of the DBT India are planning to release the DBT Scientist ‘C’ Hall Ticket 2019 in April 2019. And the DBT Scientist ‘C’ Exam 2019 will be conducted April/ May 2019 – Tentatively. Also, the notice regarding the exact date for the Admit Card release, the exam date. Until that date, you have to keep visiting our page. Aspirants who filled their application form on or before the last date of application from the official site can download their DBT Scientist ‘C Hall Ticket 2019 from here. Candidates can check all the details regarding the DBT Scientist ‘C’ Admit Card 2019 from the below section of this webpage. And we have also provided the direct download link. That link will be Activated Shortly. by providing the required credentials for the login details. Candidates are suggested to bring their DBT Scientist Admit Card 2019 on the day of the exam, without this, candidates will not be permitted to enter in the Examination hall. NOTE: Applicants are advised to check their emails at regular interval of time to ensure that the email addresses ending with dbt@nic.in are directed to their inbox folder and to the SPAM folder or any other folder for any further notification from the Department of Biotechnology (DBT). verification purpose. So, aspirants are advised to take any one of the original documents as proofs for the exam. List of the documents is given below section. If applicants are Government/ Semi Government Organisation/ Public Sector Undertakings/ Autonomous Organisations must carry NOC of their employers. Candidates who filled their Application form can download their DBT Scientist ‘C’ Admit Card 2019 from here by following the following steps. First, move on to the official website of Department of Biotechnology India (DBT) @ dbtindia.gov.in. Find the desired link for DBT Scientist Admit Card 2019 in latest section in the home page. Click on that related link for DBT Scientist ‘C’ Admit Card 2019. A new window open, then the candidates have to enter their Details like registration number, roll number, date of birth, user id or password for login credentials. Admit Card will be displayed on candidates monitor. Download the DBT Scientist ‘C’ Hall Ticket 2019 and take a print for further usage. Furthermore, all the candidates who have any queries or suggestions can leave a comment on the below section of our Freshers Now website.